TO OUR CLIENTS AND THEIR INNOVATED EXPERTISE. and the unique ideas that come directly from you. All hand-made to your specifications. we will update our web-site to reflect those new enhancements. We would like to take this opportunity to THANK all of our customers. 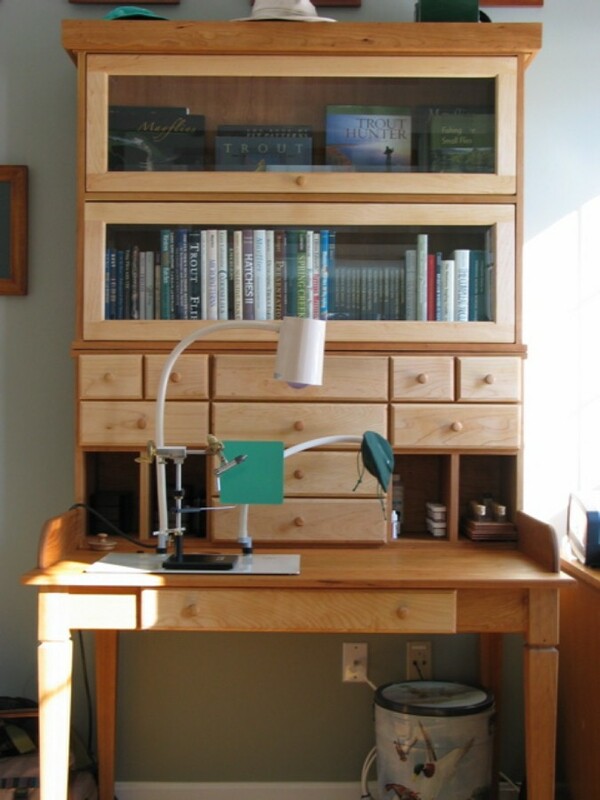 Below is a custom designed Pennsylvania Full Size Fly Tying Desk. locations like the stream or club meetings, while maintaining a full-size desk at home. The Cape May - 5 Drawer - 8 Position Fly Rod Stand and the Kitty Hawk Fly Rod Rest. The pictures show the top surface after The Carlisle was removed. Notice the additional top plate to cover the storage area. This gives our client a large full-size desk with all the accessories. 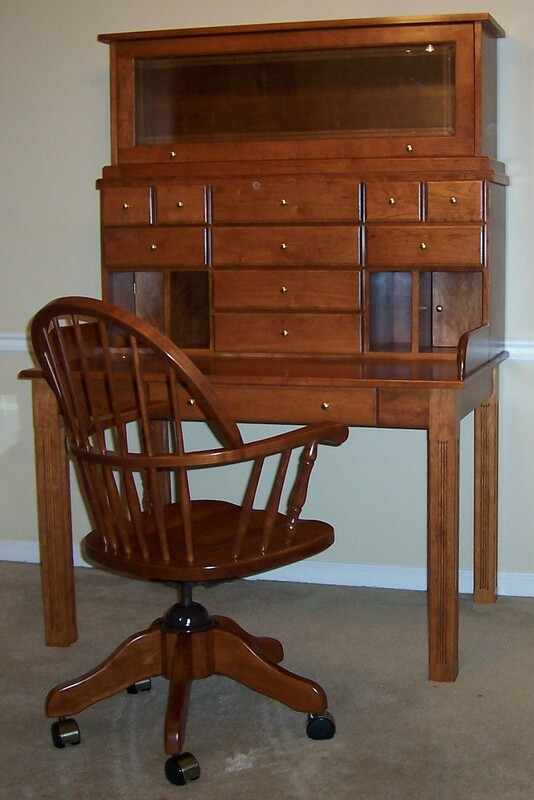 The picture shows The Carlisle Portable Desk returned to the location in the Pennsylvania. work area. Built with Solid Cherry and finished with our Dark Cherry stain. 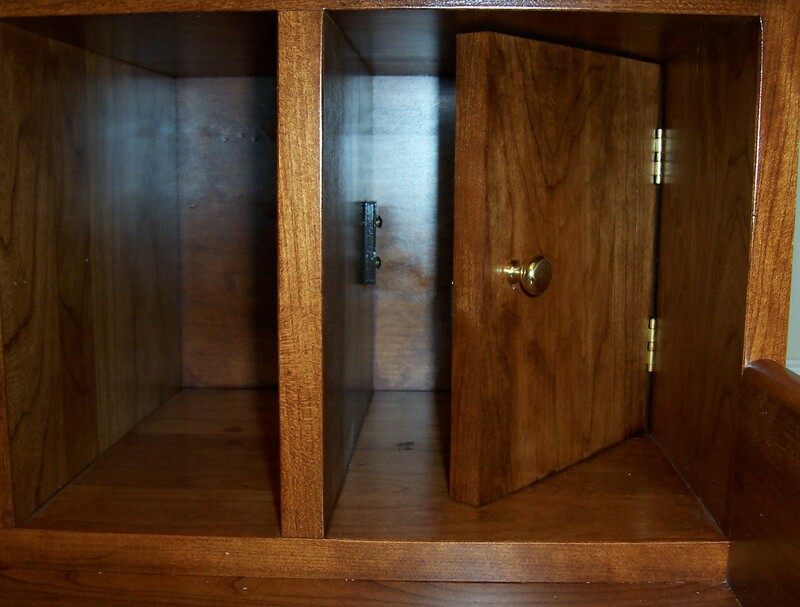 Secret compartments with doors and Spanish Cedar Drawer Linings. Fly Tying room required the extra storage space to expand upwards. Drawer and Door Fronts. These are finished with hand-rubbed Linseed Oil. he's organized and ready to tie. These pictures are the courtesy of the customer who worked with us on this design. 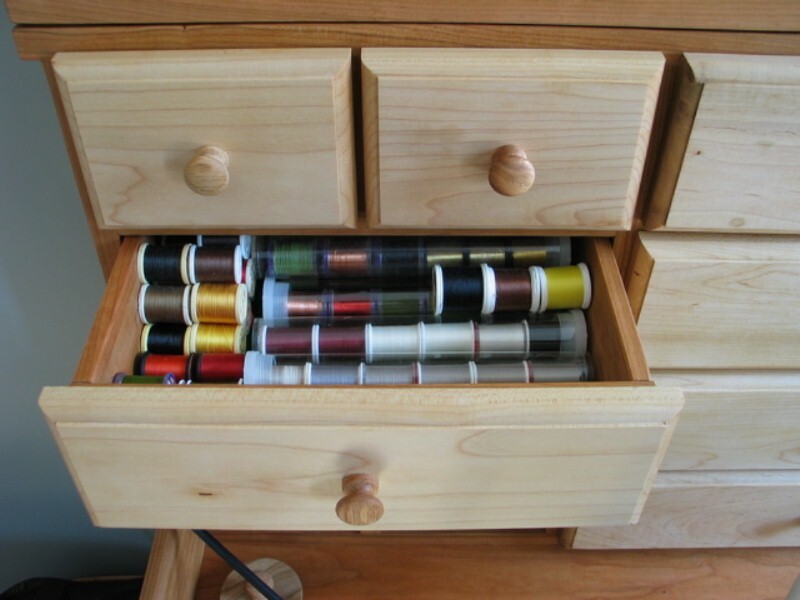 This gives the client flexibility and is a space saver when storing the fly rods. finished with our Georgian Cherry finish. Our Client is a avid BASS Fly Fisherman and Fly Tier. 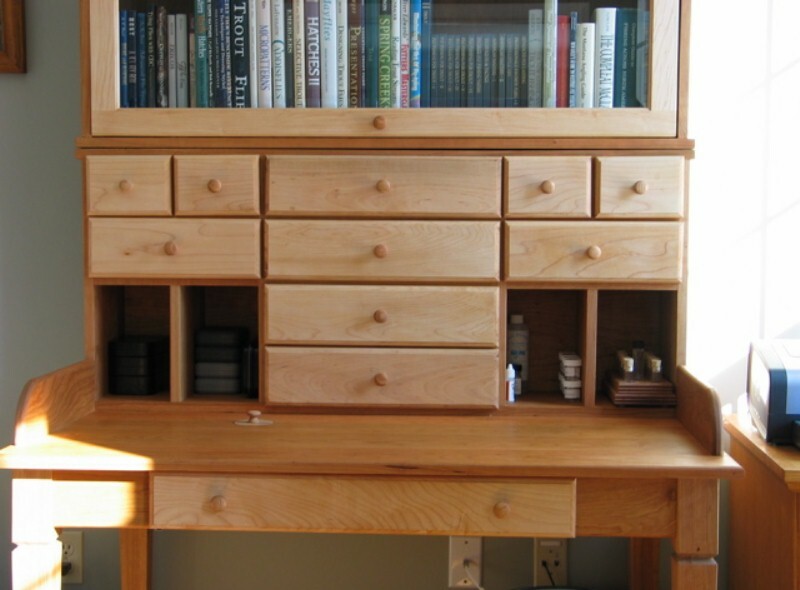 His needs required a larger (40") overall work surface with (13) drawers. a unique (moveable) tool station. request or idea was a problem to consider. My custom bass fly tying desk has exceeded all my expectations. " It was a great pleasure working with this client. His input through the entire process from start to finish was essential. We are extremely happy to help satisfy his fly tying needs. 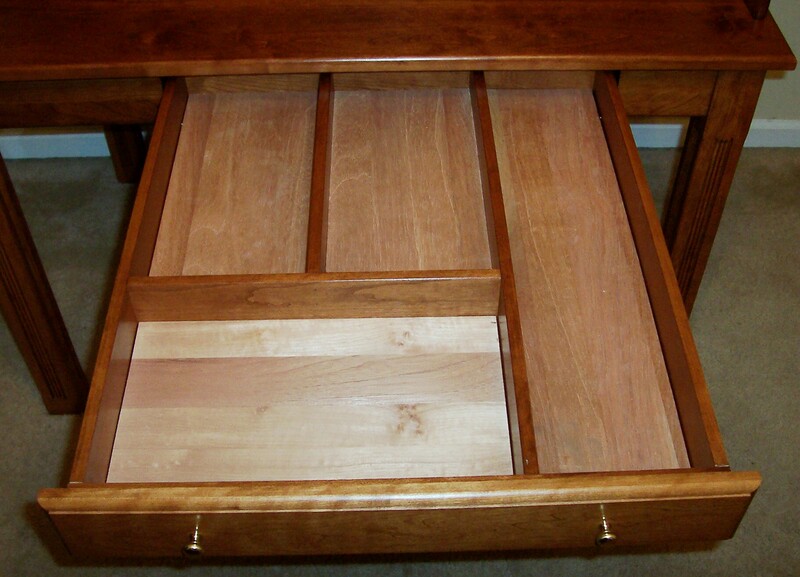 and includes a full (24") drawer extension. 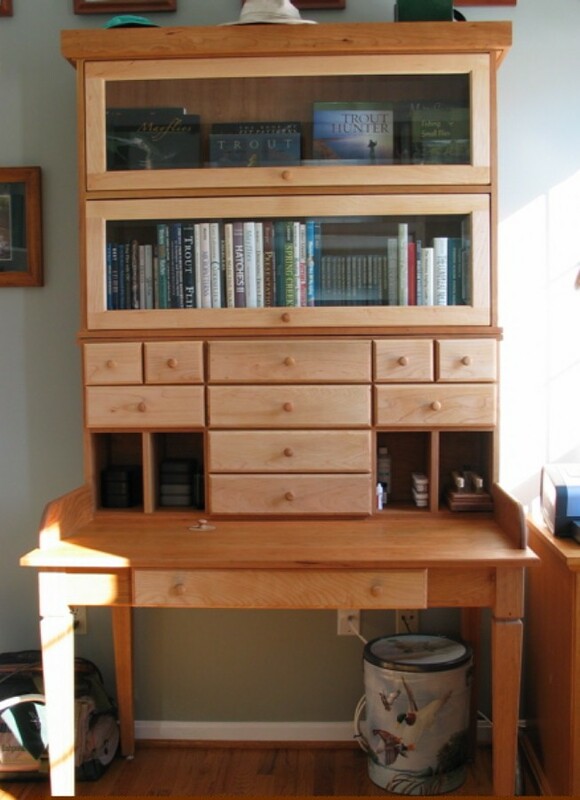 Below is a special LeHigh Red Oak Roll-Top Tying Desk. Our Client specified straight legs instead of the standard turned legs. 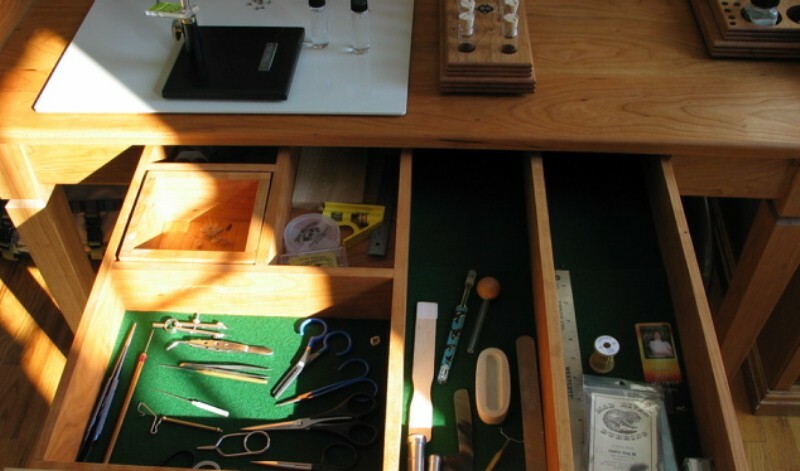 His needs required a special drawer layout and a large overall work surface. Included are moveable Tool, Spool and Dubbing Stations to fit his specification. He also ordered a Solid Red Oak "Sack-Back" Windsor Chair, we call the Ben Franklin. configuration to accommodate salt-water fly rod tubes. Multiple hole sizes are available upon request. large salt-water fly rods and tubes from his Grand Father. He wanted to keep these heirlooms safe while still being able to display them. Fly Rod Stand. We greatly appreciate his input and efforts. We have multiple hole sizes and configurations to fit any size Fly Rod Tubes. his Rod tubes during his ocean fly fishing adventures. The customer required a 7-position un-finished version. Un-finished TEAK has natural weathering characteristics and long lasting great looks. 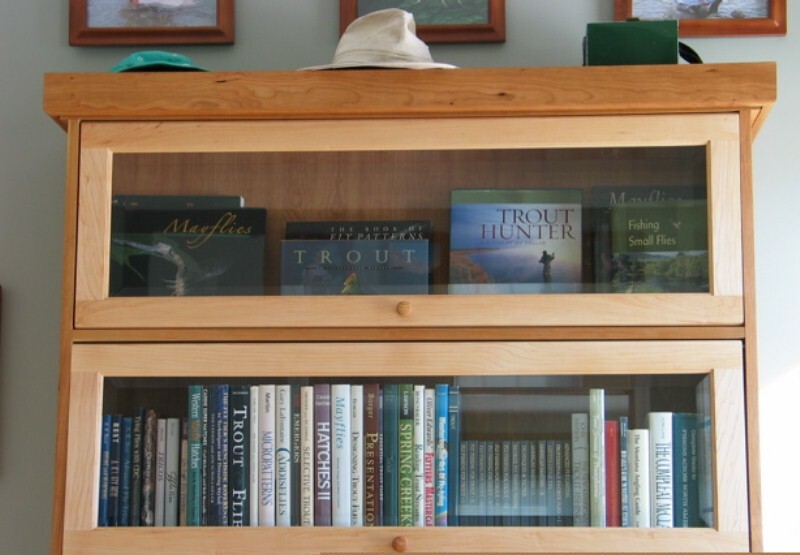 the dual levels to accommodate the height of any fly rod tube in his collection. Below are a few examples of The Cambridge almost filled to compactly.